The DC Extended Universe is moving ahead very quickly and now The Flash is one step closer to getting cameras rolling. Thanks to director Rick Famuyiwa, we know that his revisions on the script for the movie are completed. Not only that, but he has also very cleverly and casually teased an appearance by another Justice League member. The director took to his Twitter account on Monday to let us know The Flash is rapidly approaching production. He posted a picture of the script, with the page saying "current revisions by Rick Famuyiwa." He simply captioned the picture with a lightning bolt emoji, clearly signifying the movie's title character. Not only that, but he also included the legs of what appears to be the Funko Flash Pop figure standing on the script. In the background of the photo, a silver pair of legs of a different Pop figure can be seen, which appear to belong to Cyborg. It would seem that Rick Famuyiwa is teasing an appearance by Ray Fisher in The Flash movie, which would gel with what we have been hearing recently. Variety reported that Fisher has indeed signed on to star in the movie, though the size of his role hasn't been revealed. That would also coincide with what producer Deborah Snyder said back in April about The Flash and Cyborg teaming up in the speedster's first solo movie in the DCEU. As of right now, we don't know a whole lot in terms of specific plot details for The Flash movie, but the pieces of the puzzle are starting to come together. A recent report claimed that members of the villain team The Rogues would be squaring off with Barry Allen in the movie. That would make sense, being that Ezra Miller already appeared as The Flash in Suicide Squad to take down Captain Boomerang, who just so happens to be a member of The Rogues. At the moment, rumor has it Captain Cold and Golden Glider, who have both appeared on The Flash TV show, will be the main villains in the movie. That has yet to be confirmed, but we will surely be learning more details soon now that the script revisions appear to be done. 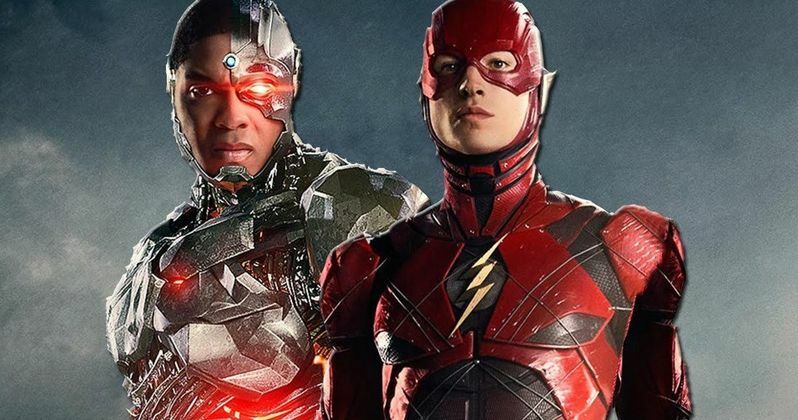 Ezra Miller will be playing the title role in The Flash alongside Ray Fisher who it seems will be reprising his role as Cyborg. Joining them will be Kiersey Clemons who is playing Iris West and Billy Crudup who has signed on to play Henry Allen, Barry Allen's dad. The Flash is set for release on March 16, 2018, just a few short months after Justice League arrives in theaters on November 17, 2017. You can check out director Rick Famuyiwa's tweet for yourself below.